Trace McSorley knows, on some level, that he faces an uphill battle when it comes to his NFL future. He's 6 feet tall. His arm is strong but it doesn't pop. He's quick but he isn't fast. It's unfair that these things matter. McSorley is by any other measure one of the best quarterbacks in college football and Penn State's resurgence has as much to do with him as anything else. His physical attributes are facts, but they aren't what define him as a player. But it might be how scouts define him. They might see a guy who is not quite big enough, not quite strong enough, not quite fast enough. Of course this isn't a new thing for McSorley to deal with. Remember that time when Penn State fans thought the same thing? Looking at pictures of him online, side-by-side with a much more physically imposing Tommy Stevens, concluding that McSorley was too short. "People still think I am." 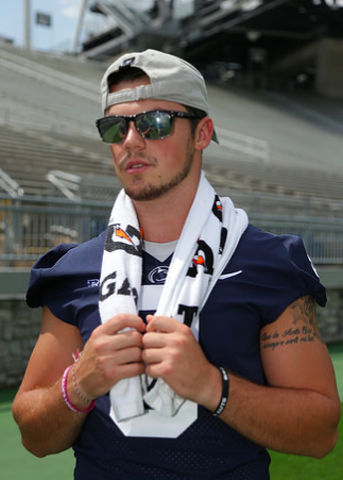 McSorley said with a smirk, looking through jet black sunglasses at Penn State's media day on Saturday. The kid from Virginia has been around for a while. So long that his media session at the podium was awkwardly quiet for a second or two before the first question was asked. By the time he took the field for the open interview period hardly anyone even bothered him with more questions. He has been at Penn State so long, what is there left to ask him. There is the question of his future though, something McSorley must have contemplated when he returned for his senior season after two dynamite years starting for Penn State. He doesn't really have anything left to prove, his stock may never be higher than it was leaving the past two seasons. But he's back. Perhaps for a mixture of reasons, he has a degree now and one last chance to prove his worth to scouts that might not ever like him as much as the big guys. Plus it's not like it hasn't been fun winning all the time. "It doesn't necessarily bother me," McSorley said. "It's just something I've always heard and gotten used to hearing and something I've used as a little bit of motivation. Being able to understand that yea I'm not the 6-foot-4, 230 pound prototype but there are other things that I do and try and separate myself in other areas that I feel like can give me a leg up." "I can only control what I can control, I can't change who I am. I feel like my arm is just as strong as the next guy and all that kind of stuff and I'm confident in what I'm able to do and that's something that Coach Rahne has instilled into myself and the quarterback room that quarterback confidence is key, and if the quarterback is not confident the rest of the offense isn't confident. So I've got to be confident in what I do, and I am, and I can't control all those other things. I can't try and change who I am." What McSorley can control, though, are his decisions, and those have been a strength. Over the span of his career McSorley has thrown 18 interceptions, a good number somewhat meaningless, and has made the smart play more often than he hasn't. McSorley's ability to avoid the mistakes has been as valuable to Penn State as his ability to find receivers down the field. If predecessor Christian Hackenberg had the arm, McSorley certainly seems to have the mental acumen to make up for what he might physically lack. As a result he currently sits on Penn State's most efficient passer rating in program history and Top 5 when it comes to interception percentage. If scouts are going to be impressed by anything, it might be the muscle between McSorley's ears. Which is a good thing in a league where careers are made based on decision making as much as arm strength. 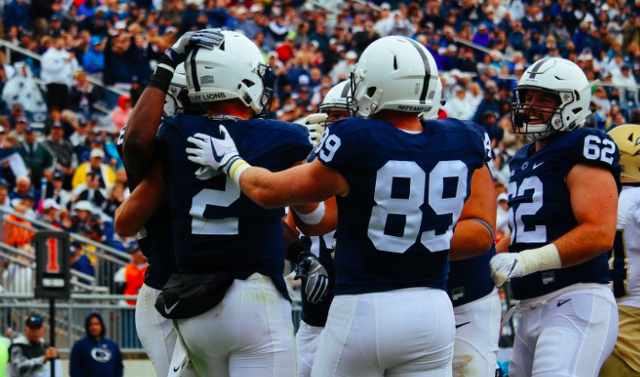 "It's something that I've always felt good about," McSorley said of his choices on the field. "It's something that even in high school my coach just preached to me. Especially my freshman year he told me "Listen, we're put a guy out there whose going to make the right decisions, who is not going to get us beat." and I took it in stride and it's something I try to apply to my game, and every time I step on the field that I'm going to make good decisions and not putting out team in jeopardy." The irony of course is that most of McSorley's mistakes, or in the very least turnovers, have been memorable. But in the big picture, it's hard to find much fault with his work. He hasn't stumble on all these records by chance. While Penn State might still have an entire season left to go before McSorley really has to think about his future, that doesn't mean a quite campaign for him to get a fair shake hasn't begun. "Trace had the characteristics that I think are most important," James Franklin said on Saturday. "He's smart. He's tough. He's a winner. Has been that way at every single level. He's got a lot of the desirable skills and traits that everybody's looking for. The thing is, he doesn't walk through the door and pass that eyeball test but I think the positive thing is that eyeball test is changing. I mean, you look at last year's Heisman Trophy winner. You look at the first pick in the draft. You look at Drew Brees. You look at Russell Wilson. In the old days, you never saw those guys in the NFL." And while McSorley might be facing a harder road than some for his shot, it has not yet been a good idea to bet against him. Anthony Whigan, a four-star offensive tackle from Lackawanna College, committed to Penn State on Tuesday morning. Whigan is ranked as the nation’s seventh-best junior college prospect, according to 247Sports. He took official visits to South Carolina and Louisville in early June, but a trip to Penn State’s annual Lasch Bash in late July sealed the deal for Whigan.